(Francisco Kjolseth | The Salt Lake Tribune) KungFu Hotpot, a new restaurant at 1465 S. State St. in Salt Lake City, specializes in Chinese hotpot cooking. 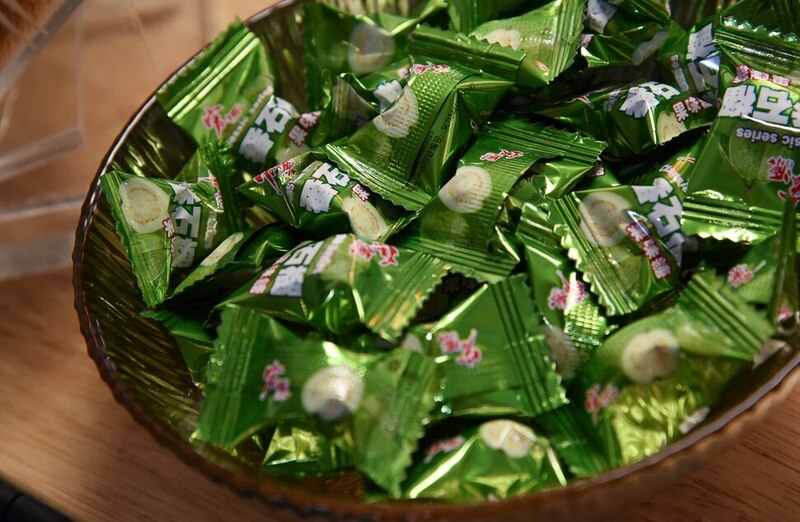 The treats given with the check are the classic guava hard candy. (Francisco Kjolseth | The Salt Lake Tribune) Joe Liao dives in during a recent lunch break at KungFu Hotpot, a new restaurant at 1465 S. State St. in Salt Lake City that specializes in Chinese hotpot cooking. (Francisco Kjolseth | The Salt Lake Tribune) A tablet is used to make menu selections at KungFu Hotpot, a new restaurant at 1465 S. State St. in Salt Lake City that specializes in Chinese hotpot cooking. (Francisco Kjolseth | The Salt Lake Tribune) KungFu Hotpot, a new restaurant at 1465 S. State St. in Salt Lake City, specializes in Chinese hotpot cooking. Using a tablet, customers can choose ingredients from a list of colorful images and descriptions like enoki mushrooms and sliced taro to add to a boiling broth. (Francisco Kjolseth | The Salt Lake Tribune) Various fresh ingredients including tofu and sliced lotus root are presented for cooking in a boiling hot broth at KungFu Hotpot, a new restaurant at 1465 S. State St. in Salt Lake City that specializes in Chinese hotpot cooking. (Francisco Kjolseth | The Salt Lake Tribune) A spicy broth boils with recently added ingredients at KungFu Hotpot, a new restaurant at 1465 S. State St. in Salt Lake City that specializes in Chinese hotpot cooking. (Francisco Kjolseth | The Salt Lake Tribune) KungFu Hotpot, a new restaurant at 1465 S. State St. in Salt Lake City, specializes in Chinese hotpot cooking with a number of broths available. 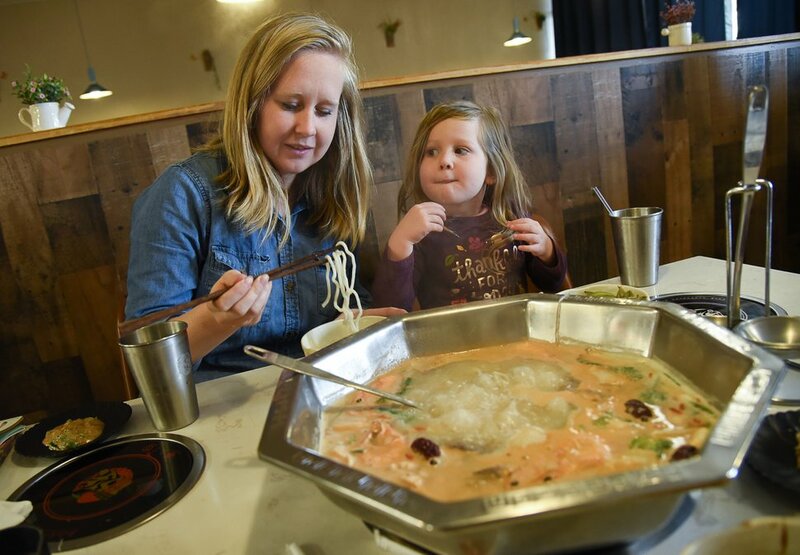 (Francisco Kjolseth | The Salt Lake Tribune) Lindsey Stockdale and her daughter Mae, 3, make a new discovery through Yelp as they stop in at KungFu Hotpot, a new restaurant at 1465 S. State St. in Salt Lake City that specializes in Chinese hotpot cooking. (Francisco Kjolseth | The Salt Lake Tribune) KungFu Hotpot, a new restaurant at 1465 S. State St. in Salt Lake City, specializes in Chinese hotpot cooking. (Francisco Kjolseth | The Salt Lake Tribune) KungFu Hotpot, a new restaurant at 1465 S. State St. in Salt Lake City, specializes in Chinese hotpot cooking. (Francisco Kjolseth | The Salt Lake Tribune) KungFu Hotpot, a new restaurant at 1465 S. State St. in Salt Lake City, specializes in Chinese hotpot cooking. 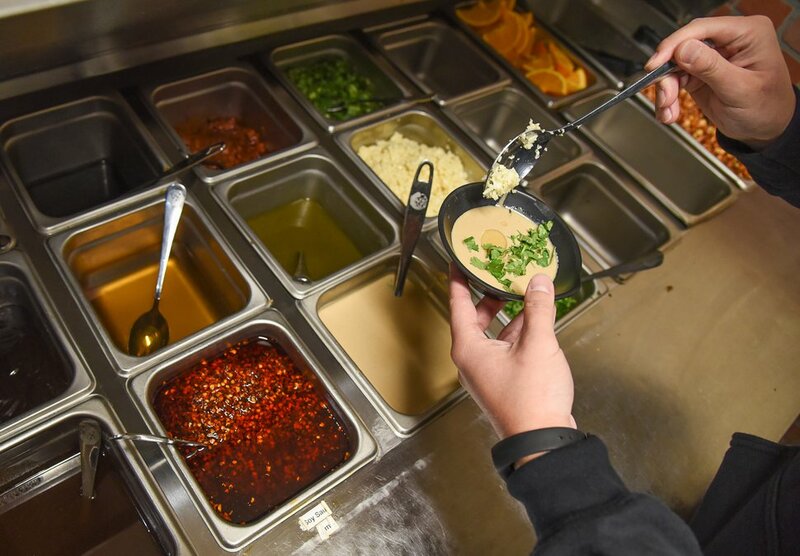 (Francisco Kjolseth | The Salt Lake Tribune) A customer assembles dipping sauces at KungFu Hotpot, a new restaurant at 1465 S. State St. in Salt Lake City that specializes in Chinese hotpot cooking. (Francisco Kjolseth | The Salt Lake Tribune) KungFu Hotpot, a new restaurant at 1465 S. State St. in Salt Lake City, specializes in Chinese hotpot cooking. 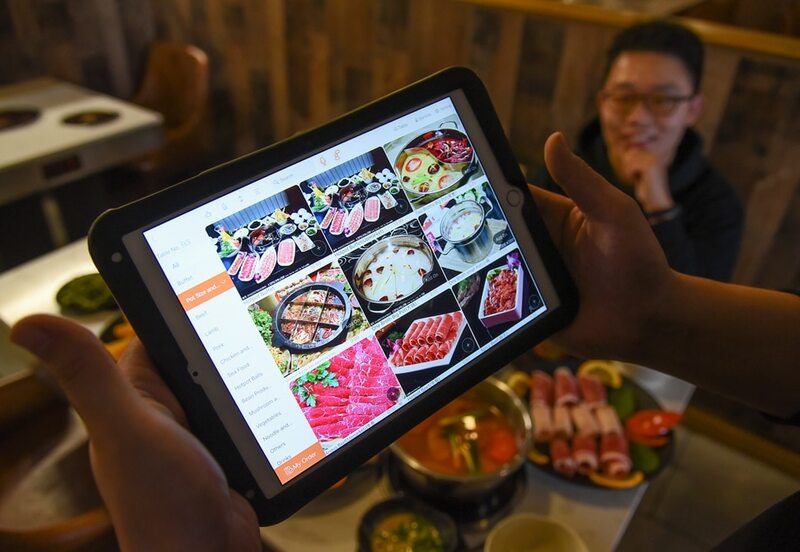 Customers can order different plates off a tablet with colorful images of ingredients like jumbo shrimp, quail eggs, fish tofu and fish to cook in the broth selected. (Francisco Kjolseth | The Salt Lake Tribune) Joe Liao dives in during a recent lunch break at KungFu Hotpot, a new restaurant at 1465 S. State St. in Salt Lake City that specializes in Chinese hotpot cooking. 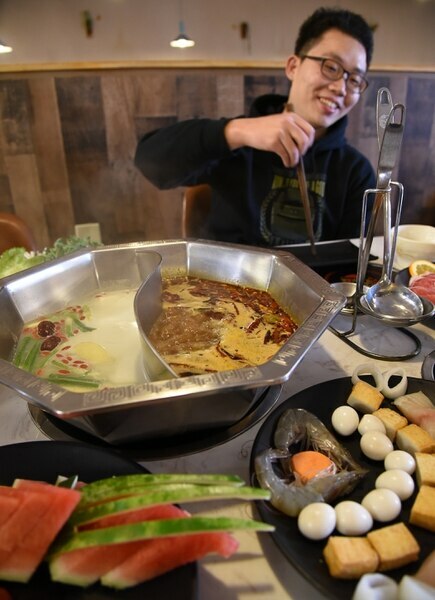 (Francisco Kjolseth | The Salt Lake Tribune) KungFu Hotpot, a new restaurant at 1465 S. State St. in Salt Lake City, specializes in Chinese hotpot cooking, where customers choose ingredients to add to boiling broths on tables with electric burners. (Francisco Kjolseth | The Salt Lake Tribune) KungFu Hotpot, a new restaurant at 1465 S. State St. in Salt Lake City, specializes in Chinese hotpot cooking, where customers select from various plates of meat or vegetables to add to boiling broths kept hot on the surface of each table. Full disclosure: I didn’t know what hot pot cooking was when I stepped into Kungfu Hotpot in Salt Lake City. We could have been visitors to a restaurant in Los Angeles, or even Sichuan, China, judging from the online reviews written in Chinese and the nearly exclusively Chinese clientele during our two visits. While we were admittedly clueless — and no doubt looked the part — on separate occasions, servers graciously explained the menu and what to do with the many platters of food that would soon arrive. They even composed dipping sauces they thought we might like. And we did. So what is Chinese hot pot cooking? Forgive the comparison to the whitest of foods: fondue. Instead of cheese, you order broth, which arrives in an enormous silver pot and is kept bubbling on burners built into the tables. You pick from a large menu of ingredients — from fresh vegetables to thinly sliced meats. You cook them in the broth, dip them in a sauce of your own creation and then eat. It was communal and comforting, even if it was out of our routine. The low lights and heavy curtains blocking out the surrounding strip mall and busy State Street made it all the more cozy. Kungfu, at 1465 S. State, serves an all-you-can-eat buffet, but not the Chuck-A-Rama style. The menus are on iPads, with helpful pictures. 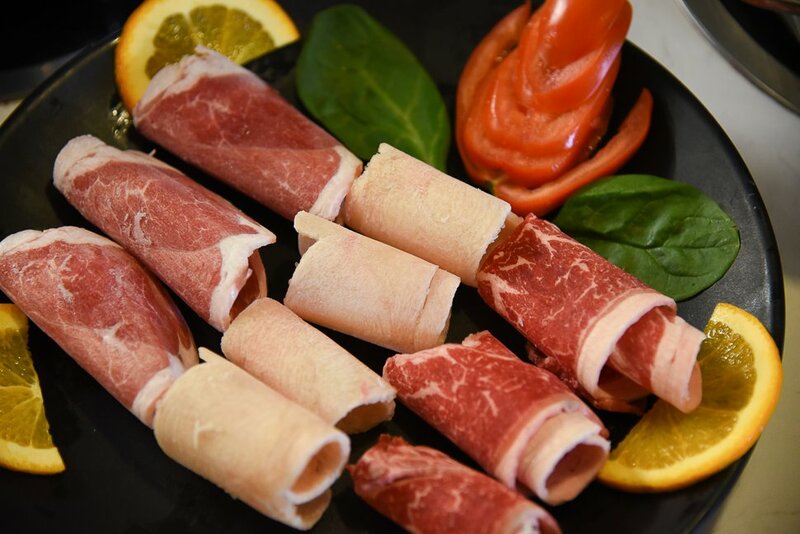 Choose the basic $16.99 or the “upmarket” $19.99, which provides more beef, fish and lamb options. Go hungry. The portions are large — around 10 pieces of each item. The restaurant sends out eight items at a time, and you keep it up until you’re stuffed. (Francisco Kjolseth | The Salt Lake Tribune) Lindsey Stockdale and her daughter Mae, 3, make a new discovery through Yelp as they stop in at KungFu Hotpot, a new restaurant at 1465 S. State St. in Salt Lake City that specializes in Chinese hotpot cooking. You start by choosing a broth. There’s beef bone, beef bone and tomato, spicy, and spicy and numbing — all of which can be less or more spicy. The beef bone broth is cloudy and silky and spiked with goji berries, large slices of ginger, whole green onions and what appeared to be Sichuan peppercorns. Our kind server led me to the sauce bar and filled a small bowl full of sesame sauce, sesame oil, spoonfuls of freshly chopped garlic, cilantro and a Chinese spicy sauce. There also are other accompaniments at the sauce bar such as orange slices, oyster and soy sauce, edamame and chopped peanuts. (Francisco Kjolseth | The Salt Lake Tribune) A customer assembles dipping sauces at KungFu Hotpot, a new restaurant at 1465 S. State St. in Salt Lake that specializes in Chinese hotpot cooking. The uncooked food comes quickly, and the staff will suggest how long to immerse the items in the burbling broth for proper cooking. It takes some experimenting, but if the food is overdone, you can only blame yourself. My table was biased toward familiar ingredients: fried tofu, thinly sliced beef and chicken, fried chicken (bone-in), eggs, rice and noodles, and all the vegetables you could want: sliced sweet potato, bok choy, broccoli, spinach, napa cabbage, daylily, taro, lotus root. The more adventurous will find beef tongue, throat, tendon and omasum (stomach), along with pig blood and quail eggs. And there’s plenty more for the meat eaters: sliced pork belly, deep-fried pork ribs, ham, Angus beef, spicy beef, sliced lamb shoulder and cooked lamb leg, along with mussels, squid rings, shrimp, mashed shrimp, jumbo shrimp and clams. (Francisco Kjolseth | The Salt Lake Tribune) KungFu Hotpot, a new restaurant at 1465 S. State St. in Salt Lake City, specializes in Chinese hotpot cooking, where customers select from various plates of meat or vegetables to add to boiling broths kept hot on the surface of each table. Drinks are minimal: soy milk, Coke, Sprite, iced tea and Chinese drinks, including a sour plum juice, and aloe and pear drinks. As the temperature drops, I find myself thinking of the thick handmade noodles, dancing in the always-hot broth. I’d add an egg, some vegetables and what the restaurant calls “deep-fried dough sticks,” or bread. As my server reminded me when he handed me a soup spoon, you can eat the broth, too. Kung Fu Hotpot • (★★ ½ (out of ★★★★). An all-you-can-eat Chinese hot pot restaurant, where diners cook ingredients — from lamb shoulder, shrimp and beef tongue to broccoli, tofu and rice — in a gurgling pot of silky bone broth. Hours • Sundays-Thursdays, 11:30 a.m.-10 p.m.; Fridays-Saturdays, 11:30 a.m.-11 p.m.